Let’s make some cute birthday cards!! This class features the fun, bold Picture Perfect Birthday Stamp set and coordinating Picture Perfect Party Designer Series Paper Stack. You will need Peekaboo Peach, Bermuda Bay, Lemon Lime Twist, Pool Party and Berry Burst ink pads for this class to go. I recommend using Fast Fuse and/or Snail Adhesive to assemble your projects. You will also need Stampin’ Dimensionals and Mini Glue Dots. This is the full Class To Go Kit. It includes the Picture Perfect Birthday Photopolymer Stamp Set, an entire pack of Picture Perfect Birthday DSP and Make & Take materials for all eight (2 each of 4 designs) cards. You will also receive the full PDF tutorial. Email me for the registration link at amy.frillici@yahoo.com. 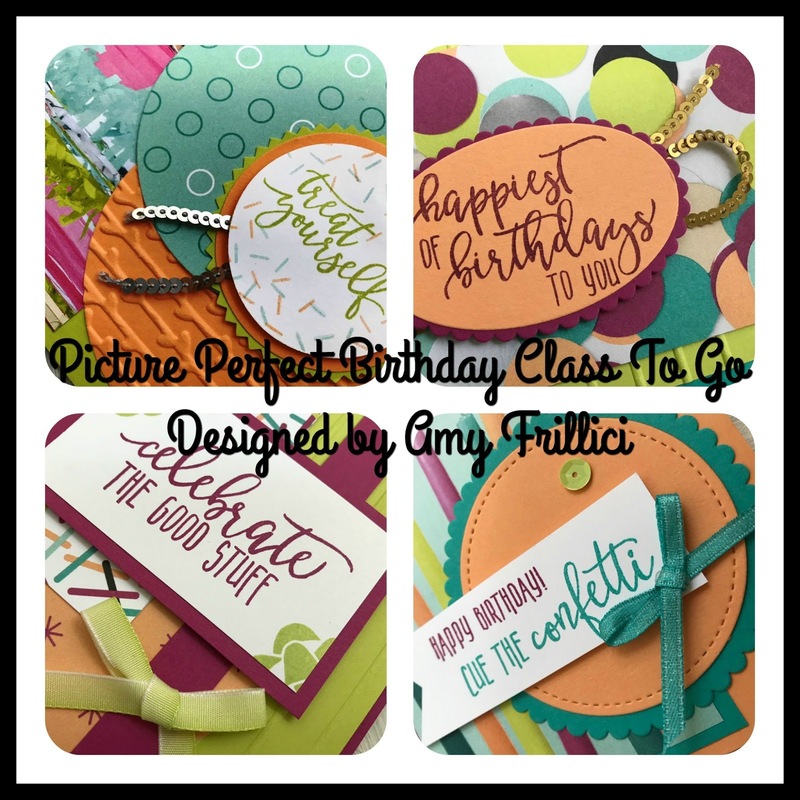 This is the Class to Go Kit for those of you who already own the Picture Perfect Birthday stamp set. You will need the stamps to create these projects, so only choose this option if you already own them. Your class to go kit will include an entire pack of Picture Perfect Birthday DSP and Make & Take materials for all eight (2 each of 4 designs) cards. You will also receive the full PDF tutorial. Email me for the registration link at amy.frillici@yahoo.com. Option #1 and #2 both ship priority mail for $7. If you are local (Alma, MI) and would like to pick up your class kit, choose "Studio Pick Up" to save on shipping. Registration will close on January 26. Expected shipping date of all kits is February 7. Amy, Please email me the link to order a PDF of your card class.